Wow great hat, I have to make one for our annual Mother’s Day hat contest next year. I admire your talents suesan, and I pray that the Lord would bless you as you continue to bless others with patterns that they can do for a past time. I am going to make some of these patterns and enjoy the gift of your talent, and being able to crochet myself. May Jesus bless you keep up the excellent work. Suzie: What a nice hat! You have incredible talent and thank you so very much for sharing your gift with the rest of us. Yours is an enjoyable site. I hope to see a lot more of your creations in the future. Suzetta...I have been looking for a hat pattern for my adult daughters and thought that this would be a nice choice. I made a test hat today and love it so much that I will keep it for myself. My daughters will both love this hat!! Thank you so much. lol..guess I should have looked closer, I found the adult pattern for the rolled brim hat. I will be making some of these too. 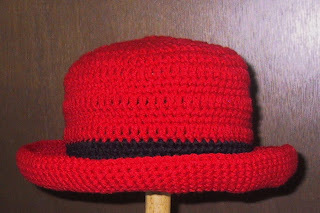 I haven't been crocheting in awhile and made one of your hats for mu 4 year old granddaugghter. It came out great! Now her mom wants one too! Thanks. I have just made 3 of these hats recently and love them! 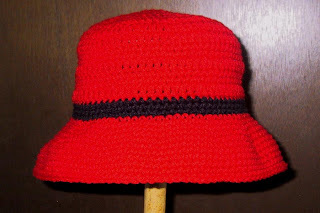 Do you have this same pattern sized down for a baby or small child? Yes there is a child's version. Check the right hand sidebar under Kid's Stuff. Thank you for posting such a well written pattern. What a thrill to find so many great hats with style! Especially the vintage hats! I recognized some from the 50's from my mother's crochet books. Can hardly wait to get started. Thanks so much. Diana in Idaho. 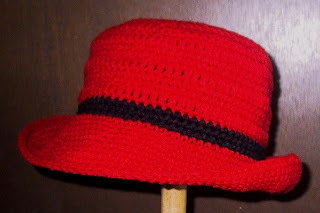 PS: Do you have any hat patterns using crochet thread? I started a hat made with thread, but never got around to finishing it. That will be a good project for this spring. When I post it I will share it online as many places as possible. Made this hat for a very special woman using yarn she gave me. She is multi-talented, having crocheted, knitted, felting, painted, interior decorator and a wonderful friend. She wore her hat the other day as temps were in the low 30's and it was snowing - perfect spring day in CT. I have to say it looked great on her, she said she received compliments every time she wore it. Love this pattern, easy to follow, make smaller or larger. I added a detachable flower. Made me happy that she was so pleased with your hat! Your comment made me happy as well. Win, win!